I think you all know how much I love spending time with you. I’m the only one of “our kind” at my house, so any time I’m with one or more of you and we can talk about sparkly things like toenail polish, cute dresses, and all of our feeeeeelings, I find it so refreshing and fun. You girl people are so neat. I can’t wait until the day four of you are my daughters-in-law. Truly, we will have so much fun together. I wouldn’t trade my life with a houseful of men for anything in the entire world, and I cherish my life for exactly what it is. This leads me to share my mom-thoughts with you, from a “mother of boys” perspective. I want to assure you of what we do intentionally at our house. First and foremost, we are teaching our boys about their need for Jesus and inviting them to seek Him alongside us. Because of that, we are working to train our boys to respect you, to treat you with care, and to show you every kindness. There aren’t any other females in our house, so whether they know it or not, our boys get to practice all these skills on me, their mom. Also, my men clear and rinse their own dishes after every meal and always, and always put the toilet seat down. Unfortunately, they still do not see all their stuff laying around on the living room table and floor and think to carry it to their room at the end of the day. I’ve done everything I can – their wives must take it from here. This might all seem like physical training (dishes, luggage, doors), but I believe what our sons are learning is that you, darling girl, deserve to be cared for, honored, respected, and loved. Do my boys sometimes say or do something inappropriate, crude, or disrespectful? Of course. So do I. I guess it runs in the family, or maybe it just shows that no matter how noble our efforts, each of us is human and needs a Savior. So, assuming that you, as a teenage girl, are also seeking Jesus, I want to encourage you to never compromise your Godly desires. That respect you want from others? Show that very same level of respect to yourself and to everyone around you – guys and gals alike. When respect meets respect, a relationship becomes un-pressured, fun, and all around great. No. Because I’m absolutely sure that if you desire God’s greatness in your life and in your relationships, you’ve already set a high standard for yourself in all these areas. You and I know that being a Godly person isn’t about following all the rules. Words like “dress modestly” and “act appropriately” land precariously all over a wide spectrum depending on each person’s perspective and experiences. Yes (for the love of my teenage, Jesus-seeking sons) do both. But do them with a pure heart motive because you are choosing God’s best, not because the purity rules dictate such behavior. Rules get us nowhere, but a heart’s conviction and desire to put others before ourselves and to seek God’s Truth in all things – well, that will change everything about how you and I see life as we strive for Kingdom living. So, Girls. I’ll continue to do my part in raising (hopeful) future husbands, fathers, men of God. You do your part in seeking His goodness in every area of your life as a (hopeful) future wife, mother, woman of God. At all times, keep the Truth in mind about who you are. Hold tight to your “list.” I know you’ve got one. It’s the list of everything you want in a guy. I had one too. About the time I thought my list was too unrealistic – like there wasn’t a guy on the planet that would meet all my expectations – I finally met him. Then he exceeded my expectations and he even wanted to marry me. God is faithful – to me and to you. Never forget this. Above all, seek Jesus and trust His promises. Treat others as you want to be treated – from the cute guy in Bible class to the elderly lady at the grocery store. Teenage girls, you are dear to me. I am on your team, in your corner, and cheering you on with more love and longing in my heart than you might be able to imagine. Seek Jesus, choose goodness, and keep on being adorable. You are cherished. Want more peace in your parenting? After 20 years of parenting and learning the hard way about truly trusting God with my four children, I wrote the Prayer Mugs. Please join me in enjoying the true peace that God offers as we raise our children! Grab your mug. Fill it to the top. 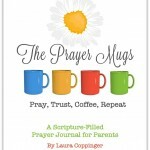 Download your Prayer Mugs eBook and enjoy the richness it offers as you surrender your kids to God.​​​​​​​ 96 pages filled with lessons I've learned through 20 years of parenting, scripture, encouragement, printables, journaling pages, and truth. I am saving this post for when our oldest daughter, who is 10 (oh my goodness! YIKES! ), reaches the teen years. Thank you Laura for sharing this and for giving me hope that our daughters will find a God-fearing man who will treat them with the respect they should be (and likewise!). I admit that I sometimes worry too much (have to keep trusting God!) about their future spouses. Guess I better work more on giving that one over to God. Thanks for motivating me to give something over to God that I should have a long time ago! You continue to be a blessing to me and my family!! Thank you! Soooo good!!! My son just married a wonderful girl this past weekend! It was a beautiful thing to see two people who followed God’s ways and waited for His best! So glad you posted this, Laura. My girl has her list and she has turned into a lovely young lady. I hope she gets the desires of her heart when it comes to finding a Godly young man. Thank you for raising four of them! Such a sweet letter to teenage girls, spoken from the heart! I’m going to look into your all-purpose cleaner. I just posted this on my Facebook page because you speak my heart more eloquently than I ever could. I am a mama of two teenage boys and one beautifully grown adult man. Thank you. I am forwarding to my three daughters who are similar in ages to your four sons – THANK YOU for encouraging them! I heart this. Love love love! As a mom of only girls, I pray for their future husbands (not all the time, need to more). I pray that their mom is teaching them to love and follow God and be respectful just as you are you teaching your boys. I pray and teach that my girls will follow God. Thank you for leading your boys. As I sit here having just read this.. I could cry.. I am so refreshed by the not-so-fear-based approach to loving the girls around your teenage boys. I haven’t had a lot of opportunity to see it done this way.. and I hope to carry this heart someday with boys I will probably give birth to! I myself have always (even irrationally) felt like a stumbling block around godly men.. though I myself desire to be a godly woman who is wholehearted in love and obedience to the lord. Part of why I feel this way includes the way mothers have treated me, sometimes without any reason, about their sons. Also I grew up with a mama who was very, very fear-based about other woman in context to her men (I have a Dad and 3 brothers, and I’m the only girl). I am now married to one of the most precious, godly men out there. We valued purity and the lord helped us to remain pure despite our ravenous desires while dating/engaged. I value modesty and also want to be a person with a real personality and style.. Even in marriage I’ve had trouble with my hubby’s well-meaning mama.. who has a really hard time with another woman being around her men (she has a husband and two sons.. one of which I’m gratefully married to!). She genuinely seems to think I am a stumbling block to them.. just because I am a WOMAN by creation! That has been really painful.. to feel like I’m wrong not because of something I’ve done, but because I am a girl. All this spilling to say I want a clean, nurturing, helpful heart toward my sons and the girls around them.. and I love the example you share here of that. Bless you sister. Beautiful, awesome. Thank you for sharing this. Thank you, Laura! I am sharing this with my 2 teenage daughters! Hello Laura. My respect for you has grown by leaps and bounds with this post, 8-). Beautiful words from your heart to all of us. Thanks you for sharing. I will be passing it on. Laura thanks for this. My youngest daughter has 2 older brothers but still needs this. from a fellow mom of all teenage boys who feels the same way…………favorite. post. ever. there’s nothing i want more for my boys than to live a life for God and find a special someone to live it with. Laura, you will make a wonderful mother in law, your a blessing! Appreciate the opportunity for the raffle. Thank you. This was so beautifully written. My daughter is 15 and the timing is perfect. It says so many of the things that have been on my heart and yet is difficult to express. May each of our kids continue to keep God first in everything. I just wanted to say thank you. 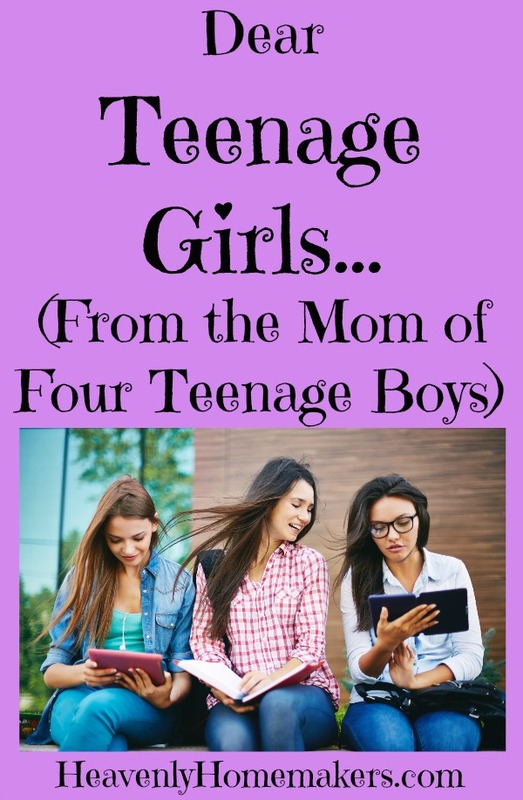 As a mother of two teenage girls and twins who are approaching teenhood this is invaluable! It’s so hard to instill good into kids who are bombarded by terrible examples and pressure every day. 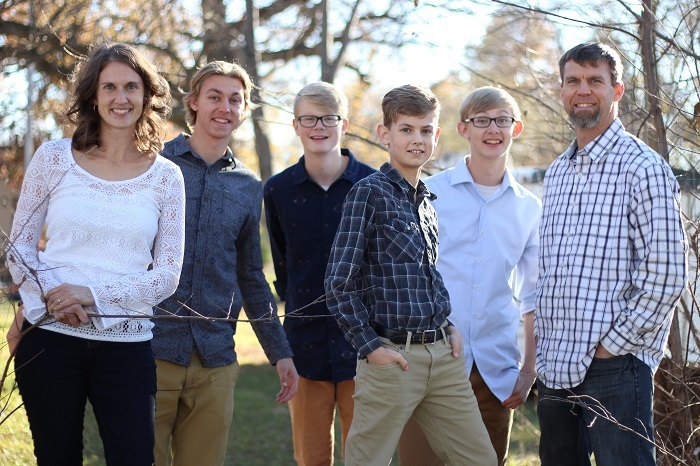 It’s great to know that there are mothers like you are out there raising Godly men. Yay! I already sent this to the eighteen-year-old and will share it with the others as soon as I’m done writing to you. Bravo! One more thing. Thank you for not making it all about the rules. It’s not about the rules. We will all act justly and lovingly if we only love and do God’s best. Please don’t get caught up in the rules. They are there as guidelines. They’re not really necessary if we love and do for God. Thanks so much for pointing this out. I keep trying to tell my girls this! God bless you and your men! What a beautiful post. How blessed your future daughter’s in law will be to have boys taught to show them respect. What a beautiful heritage to give your sons also. I have a married son of 33 and it give me so much joy to see what a great husband he is, and what a great and active father he is to his 5 and 2 year old girls. My only sorow is that he isn’t currently active in as a Christian-but I’m believing God he will return to his roots. I am sure in his heart he believes so there is hope.